Use SignalFx to monitor Azure Virtual Machines via Microsoft Azure. Azure Virtual Machine: Shows metrics of a virtual machine. Azure Virtual Machine (Classic): Shows metrics of a classic virtual machine. Azure Virtual Machines: Shows metrics of all virtual machines being monitored. To access this integration, connect to Microsoft Azure. CPU Percent - Percentage of CPU used by the virtual machine. CPU Percent Trend - Trend of percentage of CPU used by the virtual machine. Disk I/O - List of counts of disk operations. Disk I/O Trend - Trend of disk I/O bytes per second by the virtual machine. Disk IOPs Trend - Trend of the disk I/O operations performed by virtual machine. Network I/O - Number of bytes received from/sent to the network by the virtual machine. Network I/O Bytes Trend - Trend of the number of bytes received/sent by the virtual machine. The above charts are applicable to all Azure Virtual Machines. The following two charts, however, are only applicable to Burstable machines. CPU Credits Remaining - Number of CPU credits remaining for a burstable machine. CPU Credits Used - Number of CPU credits used by a burstable machine. Azure Virtual Machines - Total number of virtual machine being monitored. Top Virtual Machines by CPU percent - List of virtual machines that use most CPU. Azure Virtual Machines by Region - Count of Azure virtual machines by region. Network Bytes In - Percentile trend of bytes received by virtual machines. Top Virtual Machines by Bytes In - List of virtual machines with top bytes received. Network Bytes In vs. 24h Change percent - Comparison of change in aggregate bytes received by all virtual machines. Network Bytes Out - Percentile trend of bytes sent by virtual machines. Top Virtual Machines by Bytes Out - List of virtual machines with top bytes sent. Network Bytes Out vs. 24h Change percent - Comparison of change in aggregate bytes sent by all virtual machines. Disk I/O Bytes/Sec - Aggregated disk I/O bytes per second from all virtual machines. Disk Ops/Sec - Aggregated disk I/O operations per second from all virtual machines. 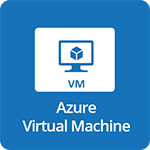 For more information about the metrics emitted by Azure Virtual Machines, visit here.